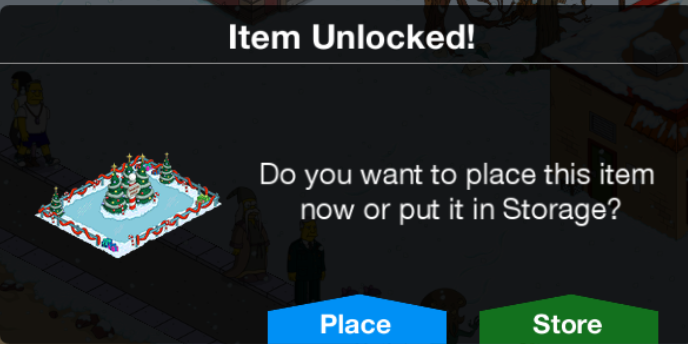 ← Should I Spend Donuts on the Returning Items in the Holiday Bazaar Round 1? Kodos: Ooo, it’s one of those perilous oblongs of ice that the humans enjoy breaking tailbones on. Let’s go skating! Kang: With eight tentacles, the skate rental will kill you. Kodos: I don’t want to go on the ice, I mearly want to hold eight cups of cocoa. Kang: You know, sometimes I regret bringing you to Earth. And there you have it, the details behind the Ice Skating Rink, the fourth Christmas 2017 prize! Worker Elves- Awarded at 10,900 . This will be the next prize we break down in the prize guidepost. What are your thoughts on the Skating Rink? Safe to assume you’ve unlocked it by now? Where have you placed it in your Springfield? Thoughts on the animation? Sound off in the comments below, you know we love hearing from you! 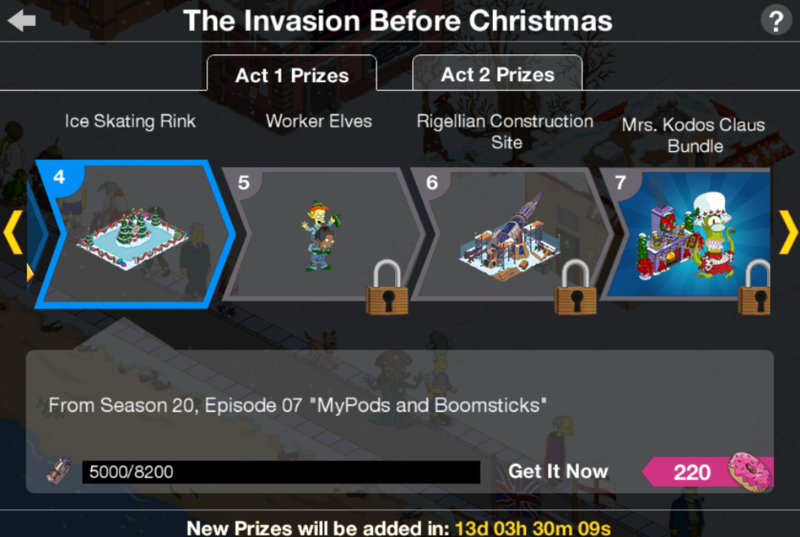 This entry was posted in Decorations, Tips and Tricks, Updates and tagged Act 1 Prizes, battery prizes, How do I get the Skating Rink, Rigellian Christmas, Tapped Out Christmas Event, Tapped Out Kang and Kodos Christmas, Tapped Out Tips and Tricks, task at the ice skating rink, The Simpsons Tapped Out, TSTO Addicts, TSTO Alien Invasion Event, TSTO Christmas 2017, TSTO Tips and Tricks, TSTO Winter Event 2017, What does the outdoor skating rink do. Bookmark the permalink. Best new decoration so far. As a Canadian we are forced by our Gov’t to be fitted with skates at the age of 2. Then tossed on ice and see what happens. The rink brings back mixed emotions.. The skating rink is beautiful. It totally deserves to have a nice bonus% attached to it. I really like this decoration and plan to add some pavement around it, a similar type of wall or barrier and some little stalls on the outside like the Hot Drink Stall for the skaters to have a drink when they have done skating. I had recently got the rink building in the mystery box and plopped it in my sports area. There happened to be the perfect sized space right next to the building, so placing this was great. I really enjoy this decoration. Maybe it’s just me, but my skating rink is permanently animated – the skaters are always there, not only when I tap it. …seriously, tho, each time you tap it, it turns the skaters on or off till you tap it the next time. Seriously EA? No permanent task? At least they finally gave us something! I’ve got all the prizes from the re-gifting machine, should I just save funzos for act 2? I managed to get a free land token on the first try of the second cycle through the prizes. I’m going to stop there and bank the rest for the next act. The next time I get mad at EA, and I will, please remind me how much I enjoy this decoration. It’s a nice one. As usual i’ve placed it somewhere where i had some place and the ‘decoration’ will start when the event is over. Yep, one of the better prizes. Good Christmas feel to it. Thanks! I had a similar idea, but was afraid the railing would interrupt the flow too much. I may give that a try, though, and also maybe Alissa’s suggestion of placing the rink in front of the building (although that seems weird to me….how would people get into the building?). The dialogue for this item actually made me laugh out loud. It is times like this which I truly enjoy the game. Too bad there wasn’t a log to go back through all the quest text that has been seen in your game. That would be so fun since sometimes I tap extra and miss some dialogue! It would be great to revisit dialogue that you found enjoyable from past items, or may have completely forgot about. It’s a great decoration. The skaters are always moving around regardless if there’s a task goin on.